Watchers, Rose B. Simpson. TIME was photographed by award winning, Santa Fe based photographer, Julien McRoberts who is renown for her stunning imagery of the Southwest. Every now and then, a project comes around that belts you in the brain, creating one of those “aha!” moments we all love but can’t anticipate. TIME stands for Temporary Installations Made for the Environment and has been around since 2005. 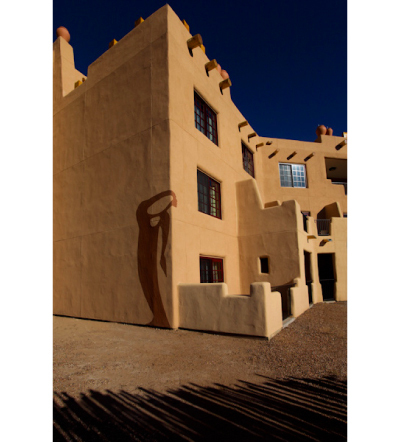 This year’s exhibition is the first under the direction of fine art consultant and gallery owner Eileen Braziel, and was photographed by award-winning Santa Fe-based photographer Julien McRoberts, renowned for her stunning imagery of the Southwest. The state-driven art project (funded by the New Mexico One Percent for the Arts act as part of the Art in Public Places program) has chosen “Green Technologies/Innovative Ideas or Materials” for its 2010 theme and features everything from a hand-painted tipi and adobe windmills to biodegradable glass bowls and solar-powered lights. According to Braziel, New Mexico is an ideal setting for the ongoing project. “In New Mexico we understand that the first innovators were the Native Indians and settlers. Solar, wind, and water are the most fundamental elements guiding green technology, and often drive ideas in New Media art installations where artists are using solar panels, LED lights, LED projectors, etc.” Additional materials used in the exhibit include traditional adobe bricks, earth, seed, biodegradable soap and recycled metals from the Los Alamos Laboratory. A barcode located on the plaque of each installation allows viewers to download free information about each artist using their phones, completely eliminating the use of paper.